Someone somewhere posted this for humor but people liked it so much that they beloved in it and shared like hell. 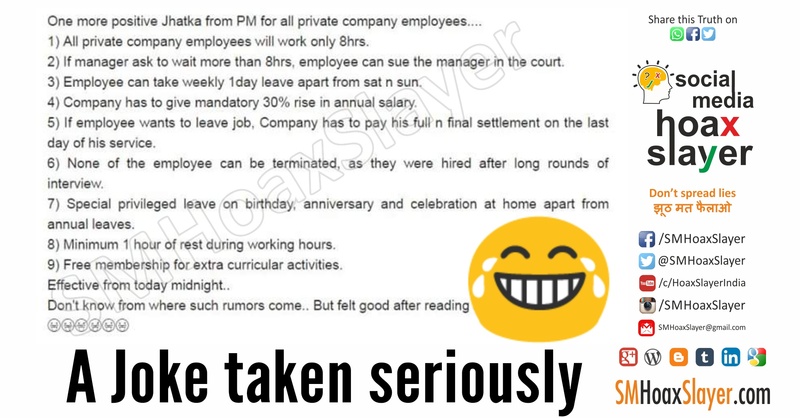 One more positive Jhatka from PM for all private company employees…. 1) All private company employees will work only 8hrs. 2) If manager ask to wait more than 8hrs, employee can sue the manager in the court. 3) Employee can take weekly 1day leave apart from sat n sun. 4) Company has to give mandatory 30% rise in annual salary. 5) If employee wants to leave job, Company has to pay his full n final settlement on the last day of his service. 6) None of the employee can be terminated, as they were hired after long rounds of interview. 7) Special privileged leave on birthday, anniversary and celebration at home apart from annual leaves. 8) Minimum 1 hour of rest during working hours. 9) Free membership for extra curricular activities. ← Did @McDonalds tweet against #Donald #Trump ? Was this AC bike made in India ? Read a completely different story. The woman in the video is not IAF Pilot Abhinandan’s wife. March 1, 2019 Hoax Slayer Comments Off on The woman in the video is not IAF Pilot Abhinandan’s wife. Is Prannoy Roy a Hindu, or a Muslim or a Christian or A Sikh….. ?